access customers’ network and data. Giving residents access to safe, clean drinking water is among the most capital-intensive and operationally-significant services provided by water utilities. From leak detection to billing integrity, ensuring the safety, reliability and cost-effectiveness of water infrastructure requires constant vigilance. Mueller Systems’ Network Operations Center (NOC) offers round-the-clock system monitoring for its customers across North America. By freeing up resources otherwise required to monitor infrastructure data, customers are able to focus on higher-value activities that improve the efficiency and return-on-investment of their water infrastructure. 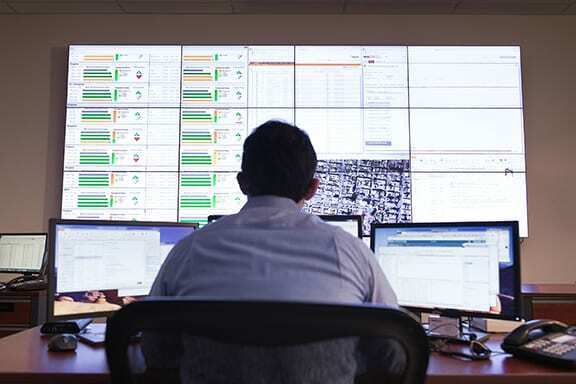 Mueller Water Systems’ Network Operations Center monitors water systems 24 hours/7 days a week and is staffed by a team of analysts from 7:00 a.m. to 7:00 p.m. ET to ensure that any issues are identified and addressed as quickly as possible.